HP Spectre One: Could This Be the Ideal All-In-One PC? When HP rolled its first TouchSmart All-In-One back in 2008, the potential of such a machine was evident even if the idea itself wasn't fully realized. Enter the 23.6-inch HP Spectre One. Gone is the IR-based touch technology used in previous devices. In its place, a capacitive, multitouch panel. And no longer do we have to suffer through an OS not designed for fingers. Windows 8 is here, which at the very least elevates touch-based Windows devices from gimmick to usable. Equipped with the latest Ivy Bridge chipsets, the Spectre One also has discrete NVIDIA graphics, up to 8-gigabytes of RAM, USB 3.0 connectivity, HDMI-in and your choice of HDD or SSD. And if you want to upgrade the machine at any point, the back panel of the curved neck is removable, revealing the motherboard guts in all their gruesome beauty. But HP also added a few unique flourishes of its own. 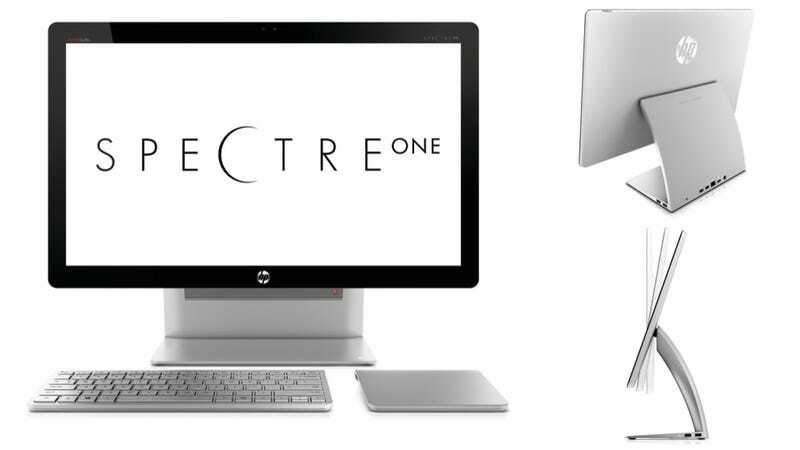 For starters, the Spectre One is equipped with NFC technology, HP supplies you with NFC tags you can place on any object, and you can program the computer to perform specific actions when that NFC tag makes contact. It might be to initiate a photo transfer. Or it might be to use your phone as a method of login. Plus it opens up the possibility of compatibility with future devices. Update: The Spectre One is not touchscreen, as originally reported. But its not just the Spectre One that's joining the WIndows 8 party; HP also has the Envy 20 and 23 TouchSmart machines, which like the HP Spectre, offer Ivy Bridge configurations, multitouch displays (20 and 23-inches, duh), and Windows 8, but without the fancy design and bonus features, like NFC. Secondly, HP says it plans to offer custom apps in the Windows 8 app store, which will make use of the Envy's touchscreen capabilities. If done right, that could be interesting. Life changing? No. More affordable? Yes.